Gold prospectors dream about locating an undiscovered patch of gold nuggets that have never been found before. Despite the amount of prospecting that has taken place in the last 150 years all throughout the West, there are still some undiscovered areas where a hard-working gold miner can still stumble upon some previously unknown gold deposits. And if you do, there is a good likelihood that it may result in many ounces of gold! Most gold nugget patches located today are found with metal detectors. With a metal detector you can quickly cover large areas, especially in places that are relatively flat and open. Most professional nugget hunters use Minelab metal detectors fitted with large coils when they are searching for a nugget patch. Eventually, a single nugget will be found. If you find a gold nugget, NEVER just wander away over without spending ample time in the area. Sometimes a solitary gold nugget might be found, but quite often there will be others that are in the nearby area that shed from the same vein. Spend ample time in the location and see what else you can find. Dig all targets in the area, even if you suspect it is all iron trash. You may find more gold nuggets. If you spend enough time in an area and you only find one gold nugget, you may decide that there was probably only one nugget to be found in that area. Sometimes that happens, and eventually you will just move on to richer ground. However, if you are fortunate enough to find several more nuggets in a given area, then you have officially found a nugget patch. Well done! 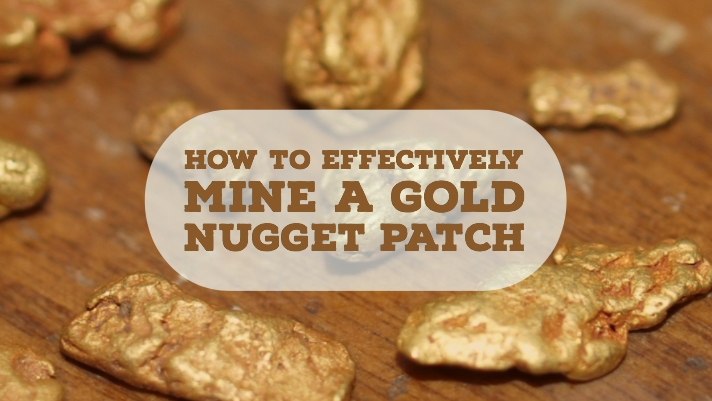 Very few gold prospectors are lucky enough to find virgin nugget patches. You will want to work the area over hard to make sure you find every bit of gold that you possibly can from the area. Prospectors can make the mistake of spending a few short hours wandering somewhat aimlessly around with their detector to search, but eventually you should grid the area to make sure you are hitting every area. It isn’t easy to find every possible piece gold in an area. In fact, there are places that many prospects can go to every year that continue to produce gold for them, even if they feel like the area is worked out. It is really very difficult to truly work out an area completely. Gridding helps you prospect as efficiently as possible. To grid efficiently, use something like fluorescent flagging of even orange road cones. Place them evenly spaced, just wide enough apart that you can get a full swing from your metal detector. This will allow you to cover a square section of land efficiently, limiting the amount of areas that are simply missed when you just zig and zag though an area. You should also experiment with different detectors and coils. At a minimum, you should at least use a good sensitive VLF gold detector and a good deep penetrating pulse induction detector. This will help you find both the smallest surface gold, but also the deeper, larger nuggets too. Most pulse induction detectors like the Minelab GPX 5000 have lots of different sizes of coils that you can use. Try a few different sizes. Each coil has advantages that might help you find another nugget from a patch. While you are metal detecting a nugget patch, take special note of where each gold nugget is found. If it is a rich patch and you are lucky enough to find a lot of gold, you might notice a pattern in where the gold is found. If you find a small location that has an especially high concentration of gold, it may be in your best interest to use another mining method to get even more gold. Assuming that you are in the desert and have no water available, your best bet is probably to use a drywasher. With a drywasher, you can shovel dirt into it and it will find smaller nuggets that your detector won’t sound off on. You might be rewarded with a considerable amount of fine gold that was missed.